Today [July 11th] The Walt Disney Company announced participants in the 2016 Disney Accelerator, a program that provides entrepreneurs with mentorship and immersion into the media and entertainment industry. The three-month program connects participants from around the world with Disney’s creative expertise and resources to help them develop their products and consumer experiences. Since the Disney Accelerator started in 2014, companies representing the cutting edge of technology and media have joined the program from across the United States, Europe, the Middle East and Asia with products that tap into a range of technologies including robotics, artificial intelligence, e-commerce, wearables, messaging and virtual reality. Past participants in the Disney Accelerator have continued to work with The Walt Disney Company after completing the program, such as, Sphero, which created the BB-8 droid toy, the number one Star Wars toy in 2015. Additionally, Statmuse, an interactive sports stats platform powered by natural language search, is currently providing ESPN with statistical content; Israel-based imperson launched The Muppets’ Miss Piggy and Disney’s Zootopia chat experiences on Facebook using their artificial intelligence technology and EMOTIV’s Insight wearable for the brain was featured on ABC Television’s The Bachelor. Decisive analyzes and predicts how audiences will respond to images and video on social media platforms. EMOTIV creates technology to enable everyone to build a relationship with their brain. EMOTIV Insight, which is available now, is a wearable for your brain that monitors emotions, improves mental performance and controls both virtual and physical objects with thoughts. HYP3R makes it easy for businesses to engage influential customers at specific locations on a personal level, in real-time. imperson is pioneering conversational media, driven by artificial intelligence, so fans can message their favorite movie and TV characters. imperson announced today that it is working with the team at Disney Consumer Products and Interactive Media Labs to create a new messaging experience for The Muppets featuring Miss Piggy coming later this fall. Littlstar is a Virtual Reality and 360 video consumer destination and developer platform, where audiences can discover and share premium immersive content. Littlstar is live on iPhone, Android, Web and the Gear VR, with more devices coming. MakieLab lets kids bring toys to life by building their own customizable 3D-printed toys through creative games and apps. MakieLab will be introducing Disney-, Disney•Pixar- and Marvel-branded accessories for Makie dolls, as well as helping kids create their own versions of a Star Darling—inspired by Disney’s brand-new franchise for girls—in Fall 2016. Open Bionics is turning children with limb differences into super heroes, creating low-cost 3D-printed bionic hands for amputees. Today Open Bionics revealed custom bionic hands for kids, and The Walt Disney Company is donating the time of its creative teams and providing royalty-free licenses, which will allow Open Bionics to offer Disney-inspired bionic hands for kids from franchises such as Star Wars, Marvel’s Iron Man and Disney’s Frozen. Pundit is talk for mobile and social—an easy way to create, share and respond to stories with your voice. StatMuse is an interactive platform for sports fans to search, share and discover sports, powered by simple natural language. On StatMuse, every search result is a piece of content and every sports fan becomes a content creator. All of the companies that were part of the 2014 Disney Accelerator have raised capital, been acquired or become profitable—and many of the participating companies have launched products and programs in conjunction with The Walt Disney Company, including Sphero’s hugely successful BB-8 droid toy that was released on Force Friday. To learn more about the Disney Accelerator program, please visit DisneyAccelerator.com. The Walt Disney Company announced that it is accepting applications for its second Disney Accelerator program powered byTechstars. Disney Accelerator will select a class of 10 startup companies for a three-month mentorship and investment program beginning July 6, 2015 and concluding with a Demo Day on October 6, 2015.The program is open to technology-based startups with a vision for making an impact on the world of media and entertainment. Participants will be offered $120,000 in investment capital along with mentor support from top Disney executives, entrepreneurs, investors and other notable business leaders from the entertainment and technology communities. For more information, please go to DisneyAccelerator.com. After finishing the 15-week immersive Disney Accelerator program, powered by Techstars, the 10 selected start-ups are currently presenting their businesses to the investment and entrepreneurial communities, industry leaders and Disney executives at a Demo Day at The Walt Disney Studios lot in Burbank, California. The companies were mentored by more than 60 Disney executives as well as 70 entrepreneurs and investors from the business community, received up to $120,000 in investment capital to develop their companies and obtained special access to Disney resources from across the Company. 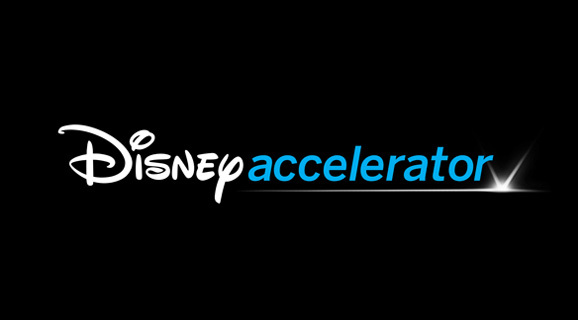 A second Disney Accelerator was also announced and is slated for 2015. ChoreMonster unites parents and kids with the most ridiculously fun and motivating family framework, so every home is a joyful place. Codarica creates seriously fun games that teach kids to code. Jogg is a mobile video platform that changes the direction of how we engage our audience. Narativ is a marketing and analytics platform for micro-content, starting with Snapchat. Sidelines is a people-powered content marketing platform that drives brand influence through discussions by expert fans. Smart Toy is a learning toy that talks and listens to kids, and can be customized to know your child’s name, teach lessons and much more. SnowShoe creates magic with a touch of plastic, and SnowShoe-powered objects unlock digital content through your smartphone. Sphero is the connected play company, fusing digital and physical play by creating toys and robots that you control with a smart device. TYFFON makes entertaining apps that put you in the center of the fun—founded by the creators of the ZombieBooth series, with nearly 30 million downloads. Lots of great milestones were reached during the course of the Disney Accelerator. For instance, Smart Toy, a company that makes toys that teach, talk and interact with children, announced during Demo Day that it has been acquired by Cartwheel Kids, a Los Angeles-based manufacturer of children’s products. In addition, SnowShoe announced that it had secured $2.2 million in seed financing and ChoreMonster and Codarica both launched mobile apps. Sphero also introduced its new Ollie product during the program, and Twigtale announced regarded pediatrician and author Dr. Harvey Karp as its editor-in-chief. Earlier this year, we announced Disney Accelerator, powered by Techstars, a first-of-its-kind program for the Company that gives today’s innovators, who are designing the future of entertainment and technology, the benefit of Disney’s expertise and guidance. Sidelines – Sidelines fixes the problem of substandard online discussions and comments by sourcing smart, high-quality discussions from its curated team of more than 400 experts, and distributing these discussions to publishers based on relevance. Ubooly – Ubooly is a learning toy that talks and listens to kids. Ubooly can be customized to know your child’s name, teach lessons and much more. For the next 15 weeks, Disney Accelerator will provide these companies with the tools and support they need to further expand their visions. Top Disney executives will serve as mentors, and each will receive up to $120,000 in investment capital to develop their companies. Participants will also have special access to stories, characters, technology and other resources from across the Company. The program kicks off with a meeting of teams and mentors, including Disney Chairman and CEO Bob Iger, and leaders from Pixar, Marvel, Lucasfilm, ABC, ESPN and Walt Disney Imagineering. Moving forward, the selected companies will consult with mentors regularly to build on their concepts and business plans, and to formulate long-term strategies. The program will culminate with a Demo Day in September, where each company will present to Disney executives, industry leaders and the entrepreneurial community. With Disney Accelerator we are now bringing the creativity and imagination of Disney to early stage startups in a way we have never done before. We are thrilled by the response we’ve received and the high caliber of applicants to the program and we look forward to sharing our knowledge with this excellent group of creative entrepreneurs and really making a difference with these startup companies.